Children can develop their creative abilities at "top speed" with this truck-shaped travel case full of colorful cargo! The triangular, non-roll design makes the 12 durable crayons easy to organize and a pleasure to use. 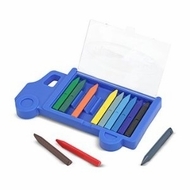 The flip-top case makes this crayon set ideal for imaginations on the go.